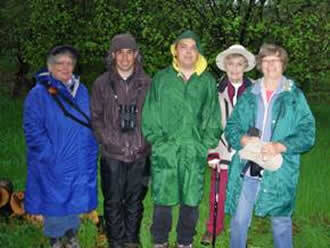 For the 2011 Birdathon, the "MBO Green Team" again focused mostly on traveling by foot from McGill Bird Observatory. Over the past three years, the species count using this approach has ranged from 64 to 98, and our goal this year was to break the elusive 100-species barrier. As always, the Birdathon is a fundraiser for McGill Bird Observatory's ongoing population monitoring programs, with 75% of the proceeds going directly to MBO, and the remainder put into a pool of funding managed by Bird Studies Canada to support research by the Canadian Migration Monitoring Network, of which MBO is an active member. To support the MBO Green Team, click here to make a secure online donation. 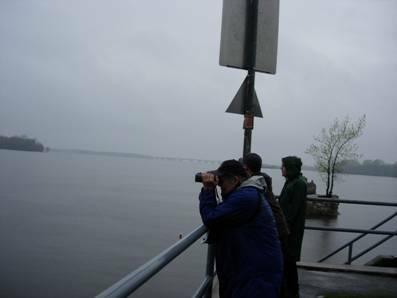 This year's Birdathon took place on May 14, with the Green Team starting off in the rain by doing census at McGill Bird Observatory. Our spirits were not dampened by the weather as the warblers were easy to see. We counted 18 warbler species and there were no mosquitoes – for now. We were pleased to have the buzzing sound of what we thought was a bumblebee turn out to be Ruby-throated Hummingbird. Singing Bobolinks also made everyone happy. Our census total was 44 species, a very good start to the day. The 2011 Green Team, deckd out in rain gear out of necessity. By this time we were all quite wet so we decided to cheat on the “green” aspect of the birdathon and drove to Rudy’s Pond. We did, however, use only one car. We were rewarded with Killdeer in the parking lot, Savannah Sparrow in the field and Green Heron and a Yellowlegs species in the pond. However, the Belted kingfisher eluded us. On to the Pine Plantation where a singing Pine Warbler was right where it was suppose to be. We also heard Red-eyed Vireo and Ovenbird but the Great Horned Owl was not to be seen. There were lots of Chipping Sparrows in the Arboretum parking lot and the grey-faced Lincoln's Sparrow with them was a bonus. We also added White and Red-breasted Nuthatches. Walking down the main trail to Blossom Corner one sharp-eyed member of our team spotted Hermit and Swainson’s Thrushes. We heard Eastern Wood-pewee and more Bobolinks in the field. Our bird numbers were climbing, but it was still raining and to make matters worse the mosquitoes came out. Not to be deterred we headed to Maple Corner where Red-bellied Woodpecker and Red-shouldered Hawk were just about guaranteed. It was not to be, but we had Orange-crowned Warbler and a Hawk sp., not the Red-shouldered. Taking a much needed lunch and drying-off break and being told that the Red-bellied Woodpecker is “always there” we decided to try for it again. A mistake, but we heard Least Flycatcher, so all was not lost. Having over 80 species, we decided to try for some water birds even though it meant driving. At least we could warm up in the car since the rain hadn’t stopped all day. Off to Ste. Anne de Bellevue, stopping on the way for the Great Horned Owl, but again no luck. It seemed to be raining harder now but we saw House Sparrow and House Finch in town, and found Common Tern, Purple Martin, and Turkey Vulture at the waterfront. An unexpected Great Egret was a great finish to the day and gave us a total of 89 species. Gay, Simon, and Michel scanning for waterbirds in Ste-Anne-de-Bellevue. We were tired and totally drenched, too wet to even go to a restaurant for coffee, so we called it a day, pleased that we had had an excellent day of birding in great company. Our total for the day came to 87 species, not bad at all for such bleak weather. The list below includes all of the species seen and/or heard during our Birdathon, broken up into rough taxonomic groups. As usual, we did rather poorly with waterbirds, but without access to large wetlands we'll always be a bit limited in that area when restricting ourselves to foot travel with MBO as a base location. On the other hand, we were up to 19 warbler species (a big jump from last year's 11, and also better than the 18 counted in 2009), and we also did well with woodpeckers, thrushes, and sparrows. As always, there were some surprising misses, including Mourning Dove and American Goldfinch. We look forward to better weather (and results) in 2012!